Gilliam has directed 13 feature films, including Time Bandits (1981), Brazil (1985), The Adventures of Baron Munchausen (1988), The Fisher King (1991), 12 Monkeys (1995), Fear and Loathing in Las Vegas (1998), The Brothers Grimm (2005), Tideland (2005), and The Imaginarium of Doctor Parnassus (2009). The only "Python" not born in Britain, he became a naturalised British subject in 1968 and formally renounced his American citizenship in 2006. The family moved to the Los Angeles neighbourhood of Panorama City in 1952. Gilliam attended Birmingham High School, where he was the president of his class and senior prom king. He was voted "Most Likely to Succeed" and achieved straight A's. During high school, he began to avidly read Mad magazine, then edited by Harvey Kurtzman, which would later influence Gilliam's work. Gilliam began his career as an animator and strip cartoonist. One of his early photographic strips for Help! magazine featured future Python cast member John Cleese. When Help! folded, Gilliam went to Europe, jokingly announcing in the very last issue that he was "being transferred to the European branch" of the magazine, which, of course, did not exist. Moving to England, he animated sequences for the children's series Do Not Adjust Your Set, which also featured Eric Idle, Terry Jones, and Michael Palin. Gilliam was a part of Monty Python's Flying Circus from its outset, credited at first as an animator (his name was listed separately after the other five in the closing credits) and later as a full member. His cartoons linked the show's sketches together and defined the group's visual language in other media, such as LP and book covers and the title sequences of their films. His animations mix his own art, characterised by soft gradients and odd, bulbous shapes, with backgrounds and moving cutouts from antique photographs, mostly from the Victorian era. Besides creating the animations, Gilliam also appeared in several sketches, though he rarely had main roles and did considerably less acting in the sketches. He did, however, have some notable sketch roles, such as Cardinal Fang of the Spanish Inquisition; the bespectacled commenter who said, "I can't add anything to that!" in the sketch "Election Night Special"; Kevin Garibaldi, the brat on the couch shouting "I want more beans!" in the sketch "Most Awful Family in Britain 1974" (episode 45); the Screaming Queen in a cape and mask in “The Visitors”; and Percy Bysshe Shelly in “Ant Poetry Reading”. More frequently, he played parts that no one else wanted to play, generally because they required a lot of makeup or uncomfortable costumes, such as a recurring knight in armour who ended sketches by walking on and hitting one of the other characters over the head with a plucked chicken. He took a number of roles in the films, including both Patsy and The Old Man From Scene 24 in Monty Python and the Holy Grail (which he co-directed with Terry Jones; Gilliam was responsible for photography, while Jones guided the actors' performances) and the jailer in Monty Python's Life of Brian. He also designed the covers of most of the Monty Python albums, including Another Monty Python Record, The Monty Python Matching Tie and Handkerchief, Monty Python Live at Drury Lane, and all of their film soundtrack albums. In another interview, Gilliam mentioned, in relation to the 9.8 mm Kinoptic lens he had first used on Brazil, that wide-angle lenses make small film sets "look big". The widest lens he has used so far is an 8 mm Zeiss lens employed in filming The Imaginarium of Doctor Parnassus. Gilliam's first successful feature, Time Bandits (1981), earned more than eight times its original budget in the United States alone. The Adventures of Baron Munchausen (1988), although it was a flop at the box office, was nominated for four Academy Awards and won three BAFTA Awards, among several other Prizes in Europe. The Fisher King (1991), his first film not to feature a member of the Monty Python troupe, had a budget of $24 million and grossed more than $41 million at United States box office. 12 Monkeys grossed more than US$168 million worldwide. The Brothers Grimm, despite a mixed critical reception, grossed over US$105 million worldwide. The Imaginarium of Doctor Parnassus, with a budget of $30 million, has been an international success at the box office, grossing over $60 million in worldwide theatrical release. According to Box Office Mojo, his films have grossed an average of $21,602,510. Other recurring collaborators include Gilliam's cinematographers Roger Pratt (Brazil, The Fisher King, 12 Monkeys) and Nicola Pecorini (Fear and Loathing in Las Vegas, The Brothers Grimm, Tideland, The Imaginarium of Doctor Parnassus, The Zero Theorem, The Man Who Killed Don Quixote), and his co-writer McKeown (Brazil, The Adventures of Baron Munchausen, The Imaginarium of Doctor Parnassus). Gilliam has several projects in various states of development, including an adaptation of Neil Gaiman's and Terry Pratchett's comic fantasy novel Good Omens. Other projects Gilliam has been trying to get off the ground since the 1990s are an adaptation of Charles Dickens's A Tale of Two Cities (starring Mel Gibson); an adaptation of Mark Twain's A Connecticut Yankee in King Arthur's Court, which has been adapted as films several times before; and a script entitled The Defective Detective, which Gilliam wrote with Richard LaGravenese (who wrote The Fisher King). While promoting the US theatrical release of The Zero Theorem, Gilliam revealed he and LaGravenese were meeting to see if The Defective Detective script could be made into a miniseries. If this comes together, it would be the first time Gilliam has ever directed for television. Stanley Kubrick had Gilliam in mind to direct a sequel to Dr. Strangelove. Gilliam was also considered to direct The Truman Show (1998). It was rumoured that Gilliam may direct or be involved in the production of the animated band Gorillaz movie. In a September 2006 interview with Uncut, Damon Albarn was reported to have said, "we're making a film. We've got Terry Gilliam involved." However, in a more recent interview with Gorillaz-Unofficial, Jamie Hewlett, the co-creator of the band, stated that since the time of the previous interview, Damon's and his own interest in the film had lessened. In an August 2008 Observer interview, Gorillaz band members Albarn and Hewlett revealed the nature and title of the project, Journey to the West, a film adaptation of the opera of the same name, based on a 16th-century Chinese adventure story also known as Monkey. In January 2008, while on set of The Imaginarium of Doctor Parnassus, Gilliam stated that he was looking forward to the project, "But I'm still waiting to see a script!" After regaining the rights to the screenplay of The Man Who Killed Don Quixote, Gilliam restarted preproduction in 2008, with Johnny Depp still attached to the project. The film was to be reshot completely, with Rochefort's role recast. Michael Palin reportedly entered into talks with Gilliam about stepping in for Rochefort and playing Don Quixote. However, Gilliam revealed on the Canadian talk show The Hour on 17 December 2009 that Robert Duvall had been cast to play Quixote, before the film was postponed once again. In January 2014, Gilliam wrote on Facebook that "Dreams of Don Quixote have begun again". At the Cannes Film Festival in 2016, it was confirmed that The Man Who Killed Don Quixote was going to be made, with Michael Palin and Adam Driver in starring roles. In March 2017, filming finally began, with Driver and Jonathan Pryce starring. On 4 June 2017, Gilliam announced that the shooting of the film was complete. During the second half of 2011, Gilliam and Paul Auster wrote a screenplay for a film adaptation of Auster's novel Mr. Vertigo. In June 2018, Gilliam announced at the Brussels International Film Festival that he was working again on Mr. Vertigo, and that it might be his next film, and that he had Ralph Fiennes attached to star in it. Gilliam has been involved with a number of charitable and humanitarian causes. In 2009, he became a board member of Videre Est Credere (Latin for "to see is to believe"), a UK human rights charity. Videre describes itself as giving "local activists the equipment, training and support needed to safely capture compelling video evidence of human rights violations. This captured footage is verified, analysed and then distributed to those who can create change." He participates alongside movie producer Uri Fruchtmann, music producer Brian Eno and executive director of Greenpeace UK John Sauven. Gilliam has been married to British makeup and costume designer Maggie Weston since 1973. She worked on Monty Python's Flying Circus, many of the Python movies, and Gilliam's movies up to The Adventures of Baron Munchausen. They have three children, Amy Rainbow Gilliam (born 1978), Holly Dubois Gilliam (born in October 1980), and Harry Thunder Gilliam (born on 3 April 1988), who have also appeared in or worked on several of his films. In 1968, Gilliam obtained British citizenship. He held dual American and British citizenship for the next 38 years, until he renounced his American citizenship in January 2006. In an interview with Der Tagesspiegel, he described the action as a protest against then-President George W. Bush, and in an earlier interview with The A.V. Club, he also indicated that it was related to concerns about future tax liability for his wife and children. As a result of renouncing his citizenship, Gilliam was permitted to spend 30 days each year in the US over the next 10 years, "less than any European". He maintains a residence in Italy near the Umbria–Tuscany border. He has been instrumental in establishing the annual Umbria Film Festival, held in the nearby town of Montone. Gilliam also resides in Highgate, London. On 8 September 2015, Variety mistakenly published a false obituary claiming that Gilliam died. In May 2018, Gilliam suffered a perforated medullary artery that was erroneously reported in the media as a stroke. 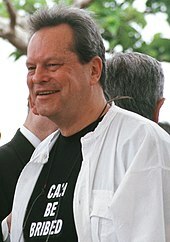 Terry Gilliam was awarded the Fellowship of the Kermodes, by film critic Mark Kermode. Raindance Film Festival announced on 13 August 2018 that he would be the next recipient of its Auteur Award for his contribution to UK film. ^ "Terry Gilliam". Desert Island Discs. 15 April 2011. BBC Radio 4. Retrieved 18 January 2014. ^ "BBC Music biography". BBC Music. Retrieved 14 September 2015. ^ The Pythons: Autobiography by the Pythons. New York: St. Martin's Griffin. 2005. ISBN 978-0312311452. ^ "Terry Gilliam '62 Honored by British Film Academy". Oxy. Occidental College. 9 February 2009. ^ a b c "Salman Rushdie Talks with Terry Gilliam". The Believer. March 2003. ^ a b "Terry Gilliam". lambiek.net. ^ Dreams: Terry Gilliam Books. Dreams: The Terry Gilliam Fanzine. ^ Cate, Hans ten (1996) "Animations of Mortality:" Terry Gilliam's New Interactive CD-ROM Game. Monty Python's Daily Llama. 16 January 1996. ^ a b Sterrit, David; Rhodes, Lucille (2004). Terry Gilliam: Interviews, University Press of Mississippi. ^ Matthews, Jack (1996). Dreaming Brazil. Essay accompanying the Criterion Collection DVD. ^ Pirie, Chris (2002). "Gilliam the Snake Charmer". Imagine Magazine (backed up on Dreams by Phil Stubbs, used with permission. ^ Terry Gilliam on YouTube. Uploaded by RoundhouseTV. ^ Stubbs, Phil (2008). "Charles McKeown on writing the Dr Parnassus script". Dreams. ^ "The clash between the baroque and the Newtonian view of the world is my message in a bottle." "Dreams: The Adventures of Baron Munchausen". ^ a b "In [Max] Weber's view, the technological world of modernity tries to eliminate any need for magic, fantasy, or any irrational forces. Gilliam presents this idea of change 'from without' through certain aspects of his mise-en-scene." Hamel, Keith James. "Modernity and Mise-en-Scene: Terry Gilliam and Brazil". Images: Journal of Film and Popular Culture, issue 6. ^ Blog, Chaz's. "The Brothers Grimm Review". Chicago Sun-Times. Retrieved 1 June 2011. ^ Stubbs, Phil (2011). "Dreams: Nicola Pecorini on The Wholly Family". Dreams: The Terry Gilliam Fanzine. ^ Stubbs, Phil: "Terry Gilliam Talks Tideland". Dreams. ^ Bianculli, David (2009). "Gilliam's Imaginarium: Surreal and All-Too-Real". 21-minute streaming radio interview (quote from the host's question and Gilliam's answer at running times 16:23–18:34). Fresh Air. National Public Radio. 22 December 2009. ^ Shell, Theresa (2009). "Exclusive! Nicola Picorini, Director of Photography, Talks to Dr. Parnassus Support Site About the Film, Heath Ledger & Terry Gilliam". ^ "Box Office Mojo". Box Office Mojo. 20 June 1989. Retrieved 1 June 2011. ^ Berra, John (2008). Declarations of Independence: American Cinema and the Partiality of Independent Production. Intellect Books. pp. 60–1. ISBN 978-1-84150-185-7. Retrieved 7 October 2010. ^ Ebert, Roger (November 2005). Roger Ebert's Movie Yearbook 2006. Andrews McMeel Publishing. pp. 400–1. ISBN 978-0-7407-5538-5. Retrieved 7 October 2010. ^ "Dreams: The Man Who Killed Don Quixote". Smart.co.uk. Retrieved 1 June 2011. ^ Haen, Theo d'; Dhondt, Reindert (5 May 2009). International Don Quixote. Rodopi. p. 254. ISBN 978-90-420-2583-7. Retrieved 7 October 2010. ^ Alica-Azania Jarvis (4 August 2008). "Pandora: Don Quixote Rides Again, Says Delighted Gilliam". The Independent. UK. Archived from the original on 19 August 2008. Retrieved 4 August 2008. ^ Cain, Sian (14 April 2016). "Good Omens: Neil Gaiman to adapt Terry Pratchett collaboration for TV". Retrieved 3 July 2017 – via The Guardian. ^ "Neil Gaiman - FAQs - Books, Short Stories, and Films". www.neilgaiman.com. Retrieved 3 July 2017. ^ IMDb: Biography for Terry Gilliam. Retrieved 22 April 2007. ^ "Terry Gilliam Bitter About Potter". Wizardnews.com. 29 August 2005. Retrieved 1 June 2011. ^ "Terry Gilliam Tilts at Hollywood Yet Again". MTV. Retrieved 21 October 2011. ^ "Gilliam Vows Never to Direct Harry Potter". Contactmusic.com. Retrieved 1 June 2011. ^ "Review: Harry Potter and the Deathly Hallows – Part One". The Scotsman. Retrieved 12 April 2011. ^ "Review: Harry Potter and the Deathly Hallows Part 1 Review". We Got This Covered (Movies). Retrieved 12 April 2011. ^ "'The Secret Tournament' – the Nike World Cup 2002 Advert". BBC. 24 July 2002. Retrieved 1 June 2011. ^ Adler, Shawn (15 November 2007). "Ledger a Big Joker When It Comes to New Gilliam Film". MTV. Retrieved 30 December 2007. ^ "Dreams: The Imaginarium of Dr Parnassus, a Terry Gilliam Film". Smart.co.uk. 25 January 2008. Retrieved 1 June 2011. ^ Stubbs, Phil. "The Imaginarium of Dr Parnassus". Dreams. Retrieved 10 October 2007. ^ "Gilliam, Ledger Reteam for Film". Variety. 31 October 2007. Retrieved 30 December 2007. ^ Dawtrey, Adam (23 January 2008). "'Parnassus' Team Faces Dilemma". Variety. Retrieved 23 January 2008. ^ Kilpatrick, Christine (24 January 2008). "Production Suspended on Heath Ledger's Latest Movie". People. Retrieved 24 January 2008. ^ "Moriarty" (15 February 2008). "AICN Exclusive! We Know Who's Paying Tribute to Heath Ledger in Dr. Parnassus Now!". Ain't It Cool News. Retrieved 17 February 2008. ...we're going to see Heath Ledger's work in Terry Gilliam's new film, and that we're also going to see three very interesting actors step up to offer interpretations of him...now we've got the names verified... Johnny Depp. ... Jude Law. ... Colin Farrell. ^ Shawn Adler (15 February 2008). "Heath Ledger's Final Film to Go Forward – With Johnny Depp, Jude Law, Colin Farrell in His Role". MTV. Archived from the original on 11 May 2011. Retrieved 15 February 2008. Report: The three actors have signed on to complete film. ... Heath Ledger died last month at the age of 28, but his final performance will live on – thanks to a little creativity and some famous friends. ... Johnny Depp, Jude Law and Colin Farrell have all signed on to film scenes as Ledger's character in Terry Gilliam's 'The Imaginarium of Doctor Parnassus,' a magical re-telling of the Faust story, according to Aintitcoolnews.com. The announcement serves as a tribute to the man many have called one of the best actors of his generation. ^ a b "Dreams: 2008 News Blog". Smart.co.uk. 10 March 2008. Retrieved 1 June 2011. ^ ParnassusFilm. "Parnassus Film (ParnassusFilm) on Twitter". Twitter.com. Retrieved 1 June 2011. ^ "Dreams: 2009 News Blog". Smart.co.uk. Retrieved 1 June 2011. ^ Hart, Hugh (7 January 2010). "How Terry Gilliam Weathered Loss of Heath Ledger to Finish Fanciful Imaginarium". Wired. Retrieved 28 January 2010. ^ Salter, Jessica (18 August 2008). "Heath Ledger's Daughter Given Wages of Stars in Terry Gilliam's Dr. Parnassus". The Daily Telegraph. Retrieved 18 August 2008. ^ Lyman, Eric. J. 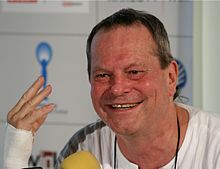 (2012)"Terry Gilliam: 'Don Quixote' Postponed Again, but Bucharest Calls (Q&A)". Hollywood Reporter. 7 July 2012. ^ McGarry, Lisa (2012). "Britain’s Got Talent: David Walliams Lands Role in New Johnny Depp Flick as Amanda Holden Says 'He Can Be Dark'" Archived 16 July 2012 at the Wayback Machine. Unreality TV. 10 July 2012. ^ Connelly, Brendon (2012). "Johnny Depp Teaming Up with Wes Anderson for the Grand Budapest Hotel". Bleeding Cool. 16 July 2012. ^ Ciuverca, Florentina (2012). "Terry Gilliam a ales România pentru noul său film". Filmreporter.ro. 17 July 2012. Translation of the first paragraph by Google Translate: "One of the most celebrated contemporary directors, Terry Gilliam, plans to shoot next production in Romania, according to U.S. media. Sources confirm to Filmreporter.ro that shooting could occur in MediaPro Studios located in Buftea in the coming months." ^ Billington, Alex (2012). "Terry Gilliam's Latest Existential Head Trip Will Star Christoph Waltz". Firstshowing.net. 13 August 2012. ^ White, James (2012). "Waltz Figures Out the Zero Theorem: Terry Gilliam's Latest!". Empire. 13 August 2012. ^ Eisenberg, Eric (2012). "Christoph Waltz to Star in Terry Gilliam's Zero Theorem". Cinema Blend. 13 August 2012. ^ Fleming, Mike (2012). "Update: Toronto: Terry Gilliam Confirms Christoph Waltz for ‘Zero Theorem’". 14 August 2012. ^ Serafino, Jason (2012). "Christoph Waltz Signs On for Terry Gilliam’s 'Zero Theorem'". Complex. 14 August 2012. ^ Schafer, Sandy (2012). "Terry Gilliam Is Making ‘The Zero Theorem’ with Christoph Waltz", screenrant.com. 14 August 2012. ^ Brown, Todd (2012). "Terry Gilliam Resurrects the Zero Theorem with Christoph Waltz" Archived 15 August 2012 at the Wayback Machine. Twitch Film. 14 August 2012. ^ Jagernauth, Kevin (14 July 2013). "Terry Gilliam Says 'The Zero Theorem' Headed to Venice Film Festival; Jessica Chastain's 'Eleanor Rigby' Also Rumored". blogs.indiewire.com. Archived from the original on 16 July 2013. Retrieved 15 July 2013. ^ "The Damnation of Faust". ENO. Archived from the original on 11 October 2010. Retrieved 23 October 2010. ^ Christiansen, Rupert (9 May 2011). "Terry Gilliam's First Opera Is a Damned Fine Glimpse of the Abyss". The Daily Telegraph. London. Retrieved 10 May 2011. ^ Clements, Andrew (7 May 2011). "The Damnation of Faust – Review". The Guardian. London. Retrieved 10 May 2011. ^ Duchen, Jessica (9 May 2011). "The Damnation of Faust, English National Opera". The Independent. London. Retrieved 10 May 2011. ^ Opera on 3 – Berlioz's Benvenuto Cellini. BBC Radio 3 broadcast, 30 June 2014. ^ "Batman's Become a Religion and More from the Zero Theorem's Terry Gilliam". cinemablend.com. ^ Brown, Todd (12 October 2013). "Stanley Kubrick Wanted Terry Gilliam to Direct Son of Stragelove". Twitch Film. Archived from the original on 13 October 2013. Retrieved 13 October 2013. ^ Charisma, James (4 June 2018). "How The Truman Show Predicted the Future". Yahoo!. Retrieved 10 October 2018. ^ Williamson, Nigel (2006). "West London Calling". Uncut. Retrieved 11 October 2006. ^ "Monty Python – Palin to Act Alongside Depp?". Contact Music. 26 May 2008. Retrieved 25 July 2008. ^ "Episode 61 – The Hour". CBC News. ^ "Terry Gilliam – Timeline Photos – Facebook". facebook.com. ^ Skinner, Craig (2016). Exclusive: Terry Gilliam’s The Man Who Killed Don Quixote to Star Adam Driver and Michael Palin; New Concept Art Uncovered. Flickreel.com. 11 May 2016. ^ Lapin, Andrew (9 March 2017). "Terry Gilliam Has Begun Shooting 'The Man Who Killed Don Quixote,' For Real This Time". IndieWire. ^ Hopewell, John; Keslassy, Elsa (2010). "Gilliam to Godfather '1884': Tim Ollive to Helm Retro Sci-Fi Fantasy". Variety. 16 December 2010. ^ Connelly, Brendon (2011). "Paul Auster Has Co-Written the Mr. Vertigo Screenplay with Terry Gilliam". Bleeding Cool. 19 August 2011. ^ Barfield, Charles (2018). "Terry Gilliam Reportedly Eyeing ‘Mr. Vertigo’ For His Next Film, Starring Ralph Fiennes". The Playlist. 29 June 2018. ^ Franklin, Garth (2018). "Gilliam’s Next Could Be “Mr. Vertigo”". Dark Horizons. 1 July 2018. ^ Lambie, Ryan (14 July 2014). "Laika Chasing Terry Gilliam for an Animated Film". Den of Geek. Retrieved 14 July 2014. ^ "Terry Gilliam Webchat – As It Happened". The Guardian. ^ Videre Website. Videre Est Credere. 23 July 2013. ^ "Terry Gilliam Sounds Off" Archived 27 May 2008 at the Wayback Machine. ShowBuzz. CBS News. 6 October 2006. ^ a b (10 February 2006). Kopflos am Potsdamer Platz. tagesspiegel (in German). Retrieved 28 April 2014. ^ Robinson, Tasha. "AV Club Interview". Avclub.com. Archived from the original on 21 September 2008. Retrieved 1 June 2011. ^ Gross, David M. (2014). 99 Tactics of Successful Tax Resistance Campaigns. Picket Line Press. p. 86. ISBN 978-1490572741. ^ "Umbria Film Festival web site". Umbriafilmfestival.com. Archived from the original on 15 July 2002. Retrieved 1 June 2011. ^ "My latest is a disaster movie". The Guardian. 4 February 2001. Retrieved 30 March 2017. ^ Child, Ben (9 September 2015). "Terry Gilliam laughs off Variety's dead Python blunder". The Guardian. Retrieved 9 February 2017. ^ J. Freedom du Lac (9 September 2015). "Monty Python's Terry Gilliam has not died. (But if he did, it was Variety's fault.)". The Washington Post. Retrieved 9 February 2017. ^ "2005 FIPRESCI". Fipresci.org. Archived from the original on 5 June 2011. Retrieved 1 June 2011. ^ "Film Winners in 2009". bafta.org. Archived from the original on 3 February 2009. Retrieved 8 February 2009. ^ "BBC – The Culture Show: The Kermodes 2009: For the Record". BBC. Retrieved 23 February 2009. 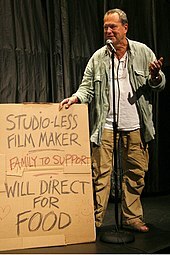 ^ "Raindance to Honour Terry Gilliam with Auteur Award". What's Worth Seeing. 13 August 2018. Retrieved 13 August 2013.